I found this recipe here . It seemed simple enough and perfect for Valentine’s Day gifts. So, I thought I would try it for my Handmade Monday project. First, I had to get together my ingredients and materials. 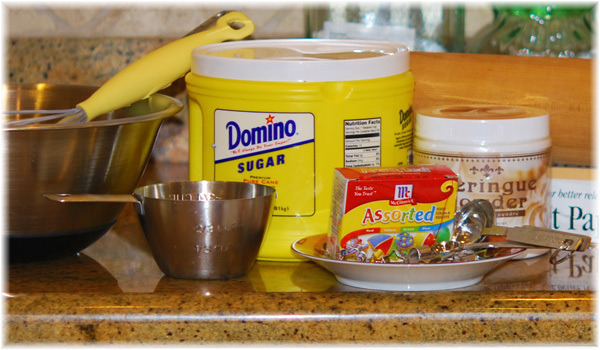 I had everything except for small cookie cutters and powdered egg whites. No problem. We had something to do Saturday morning, but after that we could run to the craft store to get cookie cutters and then the grocery store and pick up the egg whites. Small cookie cutters were were a little hard to find, but I managed to find not only hearts in several small sizes –which I bought, because I wasn’t sure if I needed really small or just sort of small– but I also bought some other shapes, just in case. If this was fun maybe I would want to do other things. I’m such an optimist. So, off to the grocery store. Powdered egg whites? No, they hadn’t heard of them. I knew I had seen them before. Next grocery store. Nope. At least they said they were “trying” to get them. Well, this was not looking hopeful. I didn’t want to have to go home and do an internet search. I wanted to make these now, not next week when I could order on the internet. Jeff recommended Williams Sonoma. Off to the Mall. The nice lady at Williams Sonoma said, no, no powdered egg whites, BUT, she carried Meringue Powder. It has a few more ingredients in it, but it might be similar enough. At this point I was game, so we bought the Meringue Powder and headed home. It turns out to have worked just fine. I think it’s about twice the cost, however, so if you can find powdered egg whites, I think you would be better off with those. According to the directions, put 2 cups of granulated sugar in a bowl. Add food coloring. I put 5 drops of red. I think I could even have put a little more for a somewhat more vibrant color. I ended up with a pink color, but I doubt you could get a really red heart. After you add the food coloring mix it well. 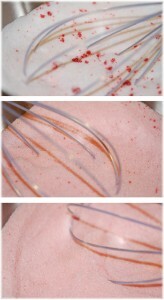 I used a whisk and kept mixing until it was incorporated into the sugar thoroughly. You can see in the photos on the right that at first it looks like an impossible task! 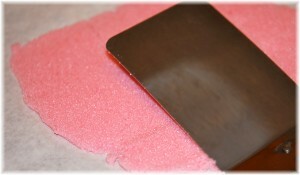 But keep working it, and it will become less of a white and red speckled mixture and more of a nice pink blend. When you see only pink, and no more red spots, you can add the reconstituted egg whites or meringue powder. I can only explain how you add the meringue powder, since that’s what I used. I assume the egg white powder has directions on it. There are NOT directions on the meringue powder, since I was using it “off label”. After reading the directions for making meringue, I decided that 2 parts water to 1 part meringue powder seemed reasonable. 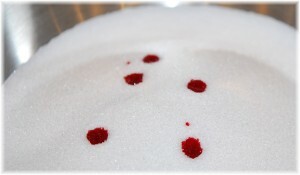 The recipe for sugar hearts called for 4 teaspoons of reconstituted powdered egg whites. So, I added 2 teaspoons of meringue powder to 4 teaspoons of water and whisked it until it was dissolved. It looked just like whisked egg whites. 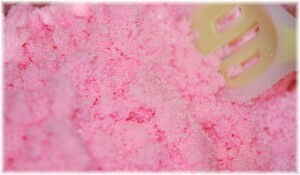 I added this to the sugar mixture and mixed with a whisk until it was completely combined. It had the consistency of wet sand (as described in the original recipe). It still seemed a little dry to me, but the recipe cautions about adding too much fluid, so I went with it. I put a piece of parchment paper on the counter top and put several large spoonfuls of the mixture on the paper and tried rolling it out flat with my heavy rolling pin. This didn’t work, it cracked and wouldn’t hold together. I finally settled on mashing it with an old solid metal spatula. This worked well. The recipe says to get it as compact as possible. You want it to hold together. Then, just take your cookie cutters and cut out your shapes (hearts in this case) and place them on a cookie sheet also covered in parchment paper. Cook them in a 200 degree oven for 10 minutes. They will be nice and hard. I did find that they were very fragile, so you have to be extremely careful. They are difficult to get from the cookie cutter to the cookie sheet. Maybe there’s a method I’m unaware of, but they either stick in the cookie cutter and sometimes crumble or break apart (ok, not usually but it’s a risk) or they don’t stick to the cookie cutter and you have to use the spatula to move them over and risk breaking them then. It’s just tedious. I also found that my mixture got dry as I worked, so I ended up making an extra batch of meringue liquid and added several more teaspoons as time went on. I could not tell that this caused any difference in the finished product. I also found (about 3/4 of the way through!) that if I cleaned my cookie cutters off and dried them periodically, things went a little better. 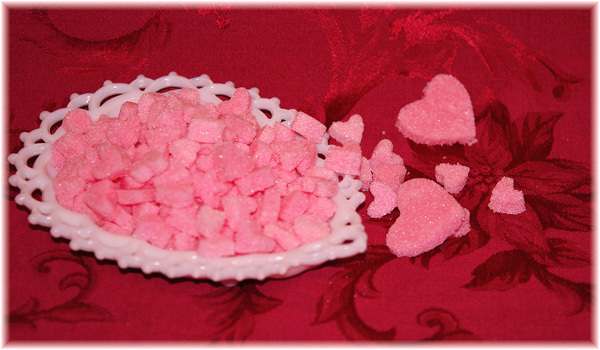 I’m still thinking that maybe my candy molds might be a better option, and may try that next time. Or, after thinking more, perhaps the difference is the meringue powder vs powdered egg whites. I will have to get some and remake them to give them a fair try. On the other hand, the meringue powder gave them a nice vanilla taste. Still, I have to admit, they are very cute. But they were time consuming and frustrating, and I am afraid they might not mail very well. I think they might crumble and break no matter how well I packaged them. I think I would only make these for someone I loved a very much! They look yummy. I am thinking of making this week for Mark. How did they taste? They taste like a vanilla sugar cube! I think if you use egg white powder you won’t have the vanilla taste (altho maybe you could add a few drops in lieu of some of the water). But the taste is wonderful! Well, if you like sugar! Well Susie all I can say is that I would have given up at the begining when trying to find the ingredients – you have a lot of patience. They do look rather nice though. Actually, I might have, except I knew I had to have a project for Monday and it would have meant going back to the drawing board! So, the choice was, keep looking for something that would work, or trying to decide on something else! I have to admit, my husband sometimes has the patience of Job, and he was the wind at my back. They aren’t as awful as they sound, I just am not very good with things that require a great deal of small, fine dexterity. I liked that these sort of mixed craft and cooking, so it had that appeal. And the original sounded so easy! I plan to order egg white powder (found it on Amazon at half the price of the meringue powder) and also thought I would try just water and also real egg white mixed with water. The science teacher in me comes out. I like to experiment. I will try different colors, just to make it more interesting for me. 🙂 Thank you for stopping for a look. Well it wasnt the easiest thing to make but the end product looks lovely. And i have such a sweet tooth i’m sure i would love them. Interesting post 🙂 Great photo’s too. Bet they taste yummy!! Thanks for stopping by, they really were good. I’m thinking, probably could get some of those concentrated flavors and do them that way too. My brain is perking. What? Am I really going to do THIS again? Now thats a way to a mans heart, sweet hearts yum. Oh, these look yummy! You have great patience! Thanks so much for taking part in Handmade Monday again – great to have you! BTW this whole Handmade Monday is fun and such a great idea and I’m glad you let me join in. I’m having a great time and so glad to get to know you all. It’s fun to meet people who do such a variety of things and with such various talents! OK. I’m going to try and make these for Rebecca this weekend. I’ll report back. Let me know. And let me know if you get powdered egg whites. I have had Hobby Lobby suggested if you cannot find them in your regular store, and also someone I know who used to do catering reminded me that temp is not enough for regular egg whites, so don’t use those. Maybe Super Walmart. So lovely color, i love pink, my favorite color, so sweeeet !